Introducing the new Blue Ox 20K Super ride! Will attach to industry standard rails that offer a 29" wide x 22" front to back measurement. 4 main things that set this fifth wheel apart from the others. 1) Easy! Self-locking hitch head. Quick and easy hook up. Latch engages the kingpin in a full 360 degrees. 2) Comfort - The hitch head is cushioned by 4 rubber springs to smooth the ride, eliminating bucking and stress on the truck and trailer. 3) Convenient - Lightweight, modular design enables one person installation and removal. 4) Travel - 11" of articulating travel for maneuvering clearance to prevent the trailer from striking the cab of short bed trucks. 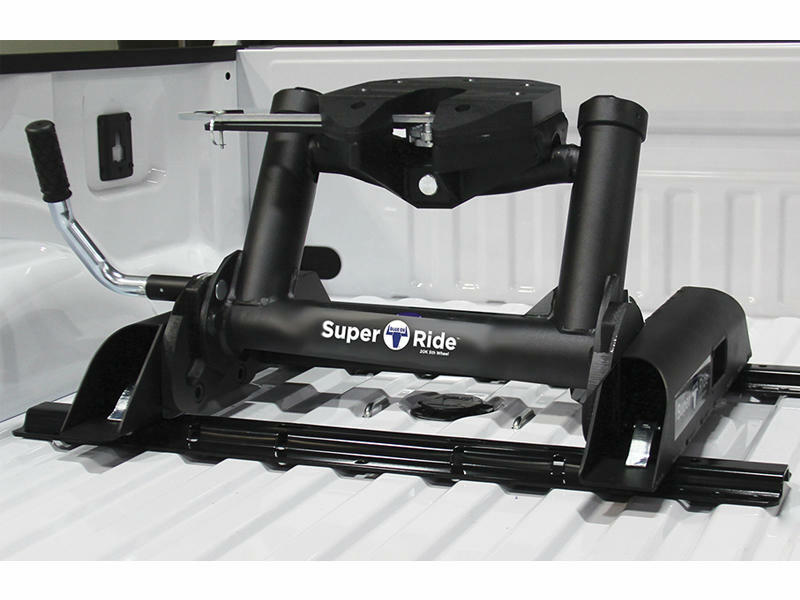 A truly one of a kind fifth wheel hitch that accommodates all kinds of fifth wheel hitch trailers! DieselTech Magazine Show Stopper Award Winner SEMA 2016! Entire unit weighs slightly over 200 lbs but can be removed in pieces for easy removal from bed.